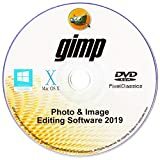 The number 1 alternative to Adobe Photoshop, GIMP 2019 is a powerful fully featured yet easy to use photo and image editing software. Now you can stop your search for the best photo editing, drawing, and converting software. This bundle includes all the tools you need in your photo editing and image creation. There's no need to pay 100s for professional photo software! Whether you are a graphic designer, photographer, illustrator, or scientist, GIMP provides you with all the essentail tools to get your job done. You can further enhance your projects with the many 3rd party plugins included in this DVD. 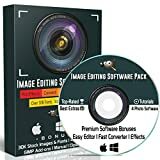 Image / Photo Converter (Win/Mac/Linux): This neat software accepts over 500 image formats and can export 70 file formats. 2 Instant Effects Programs (Win/Mac/Linux): Sketch Effect Software. Special effects Software. System Requirements: All Software is Windows (10 / 8.1 / 8 / 7 / Vista and XP), Mac OS 10.6 and Newer, and Linux compatible. ★★★ Adobe Photoshop Templates and kits for professional designs,easy to use and navigate. ★★★ Templates are in PSD, and this is a digital product we send everything via Amazon email interface. Do you want to look good on social media but you don't want to spend a lot of money on designers? If you have some basic knowledge using Photoshop you will easily produce high-quality designs. In these days it's hard to step out of the competition, big brands spend a lot on artists, photographers, and designers. Become professional today. 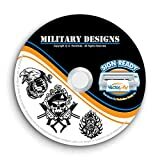 Stomp's CD Stomper Pro Labeling System is CD-labeling software offering stand-alone design and print utilities, not just templates. Print alignment and registration are built in, so you are guaranteed quality labels every time. 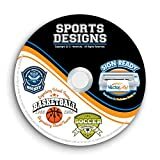 CD Stomper Pro provides 1270 predesigned artwork samples and enables you to create curved, angled, arched, and drop-angle text. This application supports multiple file formats for importing images, including JPEG, TIFF, BMP WMF, PCX, and EPS. CD Stomper Pro also supports both CD Label and Jewel Case Insert Design. It works with both PC and Macintosh platforms. 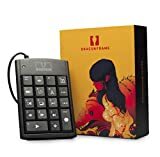 Includes the Dragonframe USB Keypad Controller, a custom keypad that provides quick access to the most important Dragonframe functions. These vector images are available in the following formats: AI (Adobe Illustrator 3.x), EPS, SVG and CDR. These are high quality vector images not pixelated/bitmap images like you see on the internet. We do not recommend that you order this product unless you understand what a vector image is and/or know how to work with them. 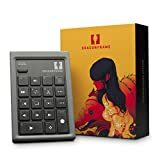 This product is not for amateurs or those who lack basic computer skills. All images are "sign ready" AKA "cut ready" (artwork is optimized for cutting and for sign making production). All images require no clean-up and can be scaled to any size without distortion. Images are detailed and very realistic. Each image is hand drawn to perfection. 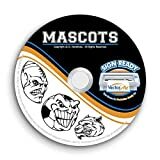 CD-ROM and images are compatible with all Windows and Mac operating systems. See description below for detailed informaton about each image file format included. Use these vector images to create your own professional artwork for your business. All images require no clean-up and can be scaled to any size without distortion. These template style vector images are saved in layers for easy editing. You can add, remove and/or change any part of the design you want. You can change the color and add your own text, phrase, brand or team name. YOU MUST KNOW how to work with vector images if you expect any results. Vector File Formats Included: EPS (EPS 8 format), AI (Adobe Illustrator 8 format), SVG (Standard XML-based vector image format) and CDR (CorelDraw 7-X7 native images).